Where Development professionals come together to share their expertise in fundraising, and to exchange best practice concepts and ideas to help advance philanthropy within our organizations. 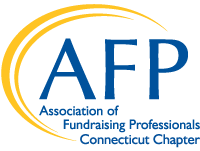 AFP Connecticut offers programs to meet the needs of our non-profit community and those involved in Development, regardless of your experience level or time in the non-profit world. We are proud to represent our chapter members and we are committed to providing you the best professional development programs, scholarships, and networking opportunities. Whether you are a newcomer to the field or a veteran, AFP Connecticut Chapter is here to support you. Welcome to the AFP Connecticut Chapter! Since 1979 we have been meeting the needs of our non-profit community, regardless of your experience level in the non-profit world. We are where Development professionals come together to share their expertise in fundraising, and to exchange best practice concepts and ideas to help advance philanthropy within our organizations. We have an amazing lineup of speakers planned for you this year that will offer the very best in professional development opportunities. You will gain invaluable knowledge and skills from these innovated educational programs and you will network with a diverse group of professionals throughout the State of Connecticut. Please contact us at: afpctchapter@gmail.com to learn more! Join our May 16th Networking and Spring workshop! Learn more about protecting your nonprofit's data with Cyber Security Specialist Sherry Pesino. SAVE THE DATES for our upcoming programs! Please see the list of our programs below and stay tuned for more information. To stay up to date with the most recent chapter information, please follow our Facebook page.